I'm 28 and I have no idea what I want to do with my life. I'm a leaf on the wind -- I go wherever the wind blows me. I spent the past 10 years as a graphic designer, then quit and went to college for a medical degree. Two years in, already disenchanted and bored, I've backed out of that too. Not really sure where to go from here. Trucking seems like a worthwhile endeavor to pursue while I figure things out. I grew up a military kid, so I've traveled and lived all over the country. As a side effect of that lifestyle, I have an insatiable wanderlust. After living in a place 3-4 years, I get the itch to move somewhere new. I love to travel and see new places. I am currently living just west of Charlotte, North Carolina, with my boyfriend of five years and our pets: a yellow lab named Simba, two cats named Gideon and Penny, and a conure parrot named Calvin. Have swallowed 12 million butterflies Im sure, now what? SWEET!! When you get some time, I would love to hear about your experience in orientation..you can PM me if you like..
Can't wait to read them when they're posted! Starting orientation with May Trucking!!!!!!!!!!!!!!!!!!!!!!!!!!!!!!!!!!!!!!!!!!! Best of luck to you! Definitely let us know how it goes for you. When your parking your truck late at night at a crowded truck stop, make sure that one and only spot left is not next to one of those cow hauling trucks, because if you back in there for a good nights sleep you're going to realize real quick why no one else had taken that spot yet. Oh boy, did this crack me up. Too funny! You have a humorous way of describing things. Loved the update though. Lots of great advice in there! Keep in touch and stay safe (and sane!) out there on the road. Just wondering. am I the youngest one here? We've had a few 21-year-olds pop in here recently, so you're not alone. :) I'm not driving professionally yet, but I start training with my chosen company next month. I'll be 28 in two weeks. Congratulations! That's awesome! Bet it feels amazing to finally have all that hard work pay off! Haven't driven a CDL in 5+ years, where should i start? Do you still have your CDL? I'm sure a more experienced person will be able to give you better advice, but it occurs to me that if you're really rusty and you've been out of practice for so long (and your driving experience was limited to only 3 months anyway), you should probably consider just going to school and starting over from scratch. It won't take long to get through training and you'll refresh all of your skills. That's what I would do anyway! A Little upset with the industry. Why do you feel your company is "not so good"? What problems are you encountering with them? 3 months isn't very long. You're still a rookie. You still haven't proven yourself. It sounds like you've gotten off to a great start in showing this company that you can be safe and productive, but you're still very much a newbie. They're still learning what you're made of. I would venture to say that whoever told you doors would start opening and people would forget your past at 3 months didn't know what he or she was talking about. Generally, a rookie should stay at his or her first company for at least a year before expecting more from the company or leaving to look for work elsewhere. If you have a checkered past, you should probably just be grateful that you have a driving job at all. While everyone else out there has told you no, the company you're with right now said yes and gave you a chance. Don't be angry with them because they haven't measured up to your expectations. If it weren't for them, you'd likely be unemployed right now. No company ever starts a rookie off with all the best loads and the most miles. The "good stuff" goes to the more experienced, proven drivers. You need to give your company more time and keep doing the best you can to prove to them that you're reliable and safe, and I bet as time goes on you'll start to see things slowly but surely improving. Expecting so much right out of the gate is only going to lead you to disappointment though. Also, I feel I should comment that companies don't hire unsafe drivers. The examples you've mentioned in your post are simply examples of young drivers making rookie mistakes. I'm sure it's annoying to more experienced drivers, but it happens. That doesn't make them unsafe drivers, though. As a trainer, you should know that. Yeeeahhh, I'm not lookin' forward to learning the shifting stuff either. We're REALLY gonna find out just how much endurance these transmissions have. I have a question. ..
Rebel, you really are crazy. Thanks for the laugh! LOL I say the same thing. "Laugh at me all you want, but let's compare driving records and then we'll see who's the one laughing." I do speed a little from time to time. But never more than 5-10 mph over the speed limit and I have to be pretty motivated to do it. This morning I woke up late for an exam in my morning chemistry class (staying up until 4-5 a.m. every night studying is killin' me) and I did 75 mph all the way to school (the speed limit is 65). That's pretty intense for me, but good grief, there were still people flying around me and riding my rear bumper like I was doing 30! Most of them, like you said, playing on their cellphones or putting on makeup. Crazy! And another "baby trucker" spreads her wings! Guy: I agree -- it's too bad YourBoyE retired from trucking, but at least he left his videos up for everyone to enjoy and benefit from. I have no doubt that those will be helpful to me as I get into this career. YouTube is awesome, lol. Carolina: Thanks girl! It's been cool connecting with you here and on Facebook. I'm really excited to follow along with your training too! Brett: My instincts tell me trucking will indeed be a good fit, and to hear it from a veteran puts a smile on my face. Thanks for all you do here on TT for us. I feel so well-prepared now; it's almost scary to think of how blind I might have gone into this had I not stumbled upon this website before going to training. My recruiter at Prime confirmed my orientation date of June 4 today. She also emailed me a bunch of harassment-related info to read and sign. I'll be faxing that back to her tomorrow. I'm testing for my CDL permit on the 16th. I've got college finals from now until Monday so I don't have much time to spend studying, but after that, it's going to be cram time until test day. Newbie in Northern California with a question for experienced truckers. I ordinarily prefer not to advocate for one company over another, but check out Roehl. Their home-time program is awesome. 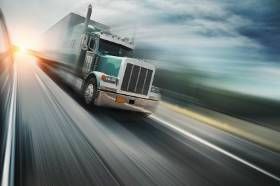 If you're looking to get into trucking without becoming a stranger to your family, it might be worth your time to give them a call and ask some questions. I agree 100% with everything you said, Amanda. I don't think you're hypersensitive though -- I think you're just sensible. People nowadays in general just don't have any sense at all. My friends and family all jokingly call me "Granny Driver" because I do the speed limit everywhere I go. It makes me chuckle because my friends are silly, but if you think about it, it's pretty sad that people pick on me and joke that I'm slow because I choose to drive at the safe, legal, posted speed. To add to your list of ridiculous things we've seen people doing while driving, I was driving to college a week or so ago and some idiot passed me reading a BOOK at the wheel. On a four-lane highway, doing 70 mph. Reading an actual paperback novel. I just found out last night that someone I know died in his sleep. The factor the docs believe caused it? Sleep apnea. He had it BAD. He was only in his 40s. So if you do have it, you WANT to know about it and get help for it now. Everyone I know who's ever used a CPAP machine raves about the difference it makes. It might be a hassle to get used to (and expensive too) but it's worth it in the long run. Celadon/Quality Drivers Im so Ready for this!! If you do need to be tested and if you have to get a CPAP machine, those expenses are deducted from your paychecks in weekly installments. You don't have to pay up front.